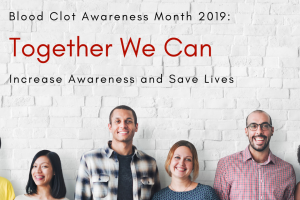 In 2015, the National Blood Clot Alliance (NBCA) introduced a new collaborative effort focused on the development of strong and lasting partnerships with the corporations that provide products and services that contribute to the prevention, diagnosis, and treatment of blood clots. This effort continues today, with additional members joining our Corporate Roundtable team each year. To help the public — including consumers and patients — understand the risks and the signs and symptoms of blood clots, as well as the importance of blood clot prevention and timely treatment. To provide members of the public with the information they need to be empowered to engage effectively with their healthcare providers about blood clot risks, signs and symptoms, and timely and effective treatment. Membership in NBCA’s Corporate Roundtable illustrates the commitment of these key corporate stakeholders to people affected by blood clots and clotting disorders. NBCA extends its appreciation to the following organizations for supporting NBCA’s mission. To improve the health of people affected by blood clots and clotting disorders through philanthropic support of quality programs aimed at increasing awareness about the impact of venous thromboembolism. To forge partnerships that lead to high-impact gains that will bring about greater awareness about blood clots, their risk and symptoms, how to prevent them, and how to treat them swiftly and effectively when they do occur. NBCA’s first Corporate Roundtable meeting took place in Washington, D.C., in conjunction with the organization’s Board of Directors meeting, April 24-26, 2015. In 2016, NBCA orchestrated its annual Corporate Roundtable meeting in Chicago, and in conjunction with the Thrombosis and Hemostasis Societies of North America meeting taking place there, April 14-16. In 2017, NBCA held its Corporate Roundtable meeting in connection with the Annual Meeting of the Anticoagulation Forum, in Los Angeles, April 20-22. This year, NBCA held its 2018 Corporate Roundtable in San Diego, in connection with the Thrombosis and Hemostasis Societies of North America meeting that took place there in March. The National Blood Clot Alliance is a 501(c) 3, non-profit, voluntary health organization headquartered in Vienna, Virginia. The organization is dedicated to advancing the prevention, early diagnosis and successful treatment of life-threatening blood clots, such as deep vein thrombosis, pulmonary embolism, and clot-provoked stroke. NBCA foresees a future in which the number of those suffering and dying from blood clots in the United States is reduced significantly. Since 2007, more than $5 million has been raised by NBCA to support our education programs for patients/families, health professionals, and the general public, as well as programs of support and volunteer development directed at achieving targeted health behaviors and outcomes. NBCA’s website has grown from 55,000 visitors annually to an estimated 2 million per year during the span of the past five years. NBCA’s reach has also been expanded through effective use of a variety of social media tools. NBCA works on behalf of people who may be susceptible to blood clots, including people with clotting disorders, atrial fibrillation, cancer, traumatic injury, and risks related to surgery, lengthy immobility, child birth, and birth control. NBCA accomplishes its mission through programs that build public awareness, educate patients and healthcare professionals, and that promote supportive public and private sector policy. As a patient-led, voluntary health advocacy organization, NBCA’s Board of Directors includes many members who have been affected by blood clots and AF, as well as other volunteers who are inspired to Stop the Clot. The Board benefits from the active support of its distinguished Medical and Scientific Advisory Board (MASAB). MASAB members include many of the nation’s foremost experts on blood clots and blood clotting disorders. NBCA is pleased to provide links to our corporate roundtable member organizations websites as a courtesy. Please Note: NBCA provides external links to its Corporate Roundtable members for informational purposes only and does not review or endorse content on these external websites.